After seeing several articles and a presentation at TAS about amateur astronomers being able to observe Exoplanets, I decided to give it a try. My expectations were low given the light pollution conditions at my observing location (center of Dallas). I identified a candidate transit and utilized my equipment to collect the data. 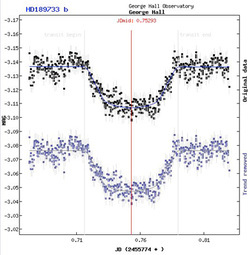 It took me several weeks and numerous e-mails with Ken Hose (an observer that had experience observing Exoplanets) to understand how to process the data. I was surprised and amazed to see clear evidence of the Exoplanet transit in the data that I had collected from my back yard. The image to the left is an example light curve from one of the better transits that I have been able to capture. Click on the image to see a briefing that I presented to my local astronomy club, the Texas Astronomical Society (TAS) on my efforts. Here is a link to a video recording of that presentation. Below are links to Exoplanet Transits that I have collected thus far. The data from these transits has been submitted to a data base of amateur Exoplanet Transits maintained by the Czech Astronomy Society.